Are you looking to give a gift that pampers the special person in your life? These gift sets from L’Occitane are the perfect gift idea for that special person on your Christmas list. The special person on your list will enjoy these amazing gifts sets. Each product is made with quality ingredients. No matter which one of these gift sets will give you the chance to try some of L’Occitane’s amazing product line. Whether you choose from their skincare line, bath and body, hand care, fragrances, and even the perfect gift for the man in your life. During the holidays, we often neglect to pamper ourselves. These gift sets are the perfect gift to give your loved one. We love getting gifts sets because it is a great way to find new products. 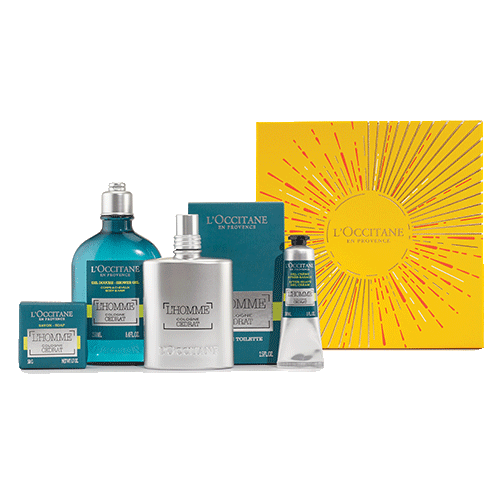 Check out these 3 amazing gift sets from L’Occitane! Do you love getting gift sets for Christmas? My mom only uses L’Occitane products. This is great, because she’s the last person I have to shop for and that hand cream sounds perfect for her. Oooh. That hand cream bouquet sounds amazing! I would love to find that under the tree. I have never heard of I’occitane products before. I love the different sets it comes in!! I’ll have to keep my eye open for it in the stores! Nice gift ideas! Cologne for me, nourishing shea butter collection for my wife. Good scores! Great gift ideas! I am obsessed with L’Occitane products! I first discovered their products on a trip many years ago (duty-free department at the terminal) and I’ve been using their products ever since. I just love the L’ Occitane products! Thanks so much for sharing these lovely give sets. I have tried a couple of these products. I love them. Great ideas for Christmas. I love products with shea butter. I used one during my pregnancies and never got any stretch marks. I always get a hand cream for my sons’ teachers! Such great gift ideas. Who would want something from L’Occitane?! I just love L’Occitane! It’s the only products I can use that do not break me out. I’ve never tried L’Occitane before but it sure sounds like they make great products. I have super dry skin so this might work really well for me. I have a few people who would love these sets for Christmas. I’m STILL Christmas shopping so this helped me out a bit with some ideas! I think I’d only like getting a gift set from myself, or from someone who knows me well enough not to get something I wouldn’t use at all. If someone got me a perfume gift set I wouldn’t be as happy as say… a coffee and mugs gift set or something like that. The Shea butter set sounds like something I would like though. This is my first time to see that product, I think that would be great gift idea for myself. What some fantastic sounding gift sets L,Occitaine really seem to do some amazing bits for the whole family, for me I would sure love to find that she’s butter set under the tree. These are wonderful gift ideas! I had never heard of the brand before but these gift sets are fabulous! I’ve heard so much about Loccitane but I’ve never tried their products. As a lover of the “butters” the Nourishing Shea Butter Collection sounds amazing. I have never heard of L’Occitane until now. They sound like great products. The Hand cream looks like it’d be the perfect gift. L’Occitane is def a favourite for me. I love the % moisturizer and i was in heaven when I visited Charleston and they had a store there.